For My son in law's birthday I was looking for an easy to bake and yet a fancy cake recipe. 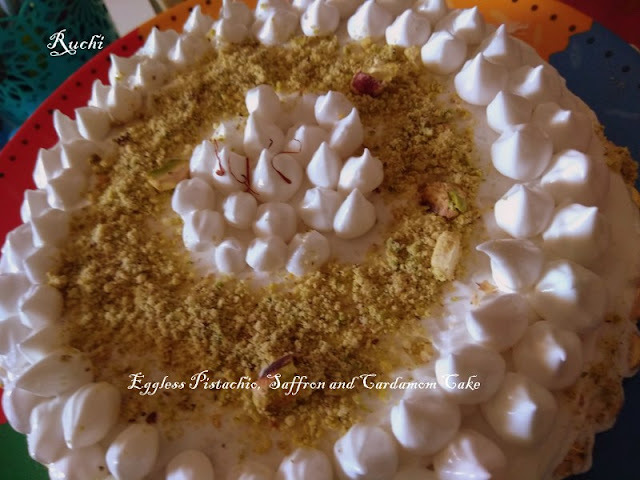 While browsing recipe ideas for the same, I noticed that Saffron pistachio cake is quite famous. It looked exotic and elegant. 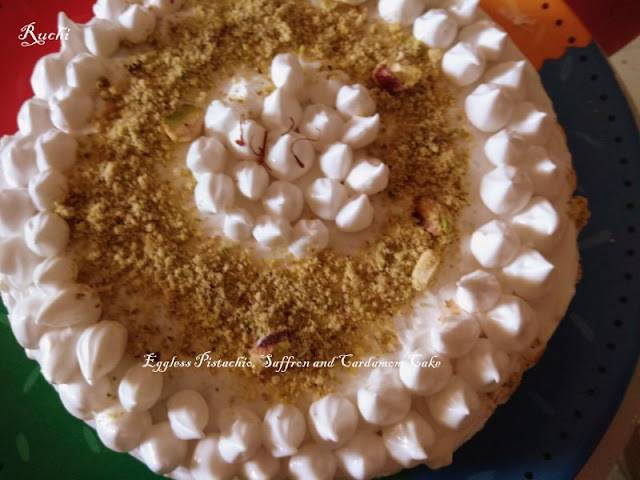 This Moist and delicious cake infused with saffron ,cardamom flavor with a chopped pistachio. 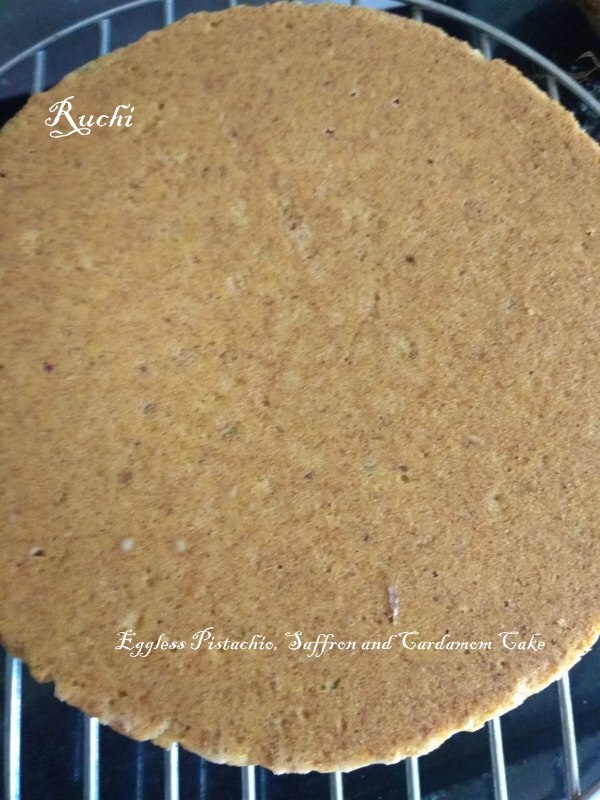 The richness of the Pistachios coupled with the delicate saffron just melts in your mouth. The cake turns out moist, flavourful and delicious. It is very festive in appearance It is rich in taste and flavour. 1.Preheat the oven at 180deg C.Grease a bakingpan. 2.In a bowl sieve maida, 2 tbsp sugar, baking soda, baking powder and keep aside. 3.Take a large bowl, add butter, condensed milk, Pistachio powder,cardamom, vanilla extract and saffron milk mix together and whisk for 2 minutes to form a smooth batter. 4.Using a spatula, fold dry ingredients to the whisked batter and mix well. Mix till well combined. 5.Pour the batter into the baking pan and bake for 20 minutes. 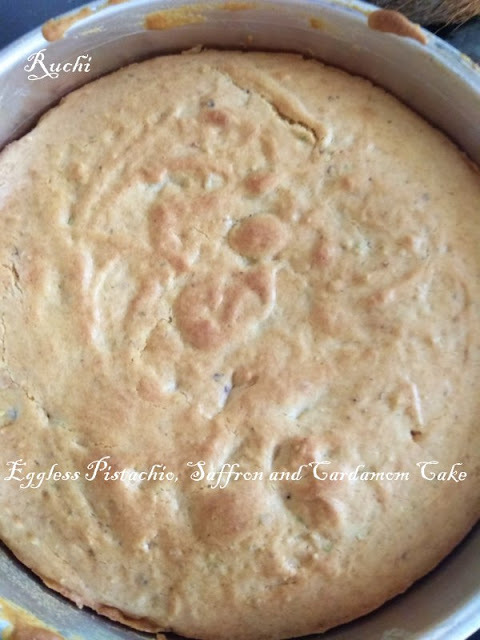 6.After 20 minutes, poke a toothpick into the centre of the cake and remove instantly. If the toothpick comes out clean, it means the cake is cooked completely. 1. Using both a chilled bowl and chilled beaters, beat the cream until frothy. 2. Add the icing sugar and vanilla gradually while beating. 3.Whip until light and a thick enough consistency to spread as an icing.